New analysis of ancient Jian wares reveals the distinctive pottery contains an unexpected and highly unusual form of iron oxide. This rare compound, called epsilon-phase iron oxide, was only recently discovered and characterized by scientists and so far has been extremely difficult to create with modern techniques. 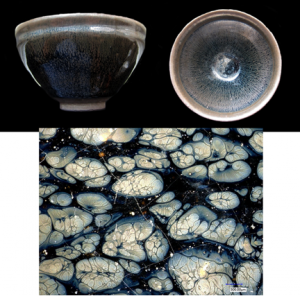 Modern replica of a Tenmoku tea bowl (top) with “oil spot” surface patterns produced by Prof. Weidong Li, Shanghai Institute of Ceramics. Close-up of the oil spot pattern from an ancient Jian ware provided by the Museum of Fujian Province. “What is amazing is that the ‘perfect synthesis conditions’ for epsilon-phase iron oxide were encountered 1000 years ago by Chinese potters,” says Catherine Dejoie, scientist at Berkley Lab’s Advanced Light Source and ETH Zurich. The study, published May 13 in Scientific Reports, could lead to an easier, more reliable synthesis of epsilon-phase iron oxide, enabling better, cheaper magnetic materials including those used for data storage. The study was performed by an international team of researchers from China, France, Switzerland, and the United States, using a variety of analysis techniques at Berkeley Lab’s Advanced Light Source, the Stanford Synchrotron Radiation Lightsource at SLAC National Accelerator Laboratory, and the Centre d’Elaboration de Matériaux et d’Etudes Structruales in France. In addition to Dejoie, Berkeley Lab scientists Kai Chen, Martin Kunz, Nobumichi Tamura and Zhi Liu were also authors on the paper. Jian wares, such as tea bowls, are famous for their shiny black glaze and variable brown and silvery surface patterns known as “oil spot” and “hare’s fur.” The ceramic bowls, produced thousands at a time in giant kilns, were made during the Song dynasty in the Fujian Province of Southeast China between 960 and 1279 AD. Today, surviving Jian bowls are highly prized. To make the pottery, ancient artisans used local iron-rich clay coated with a mixture of clay, limestone, and wooden ash. Kiln temperatures of 1300 degrees Celsius (nearly 2400 degrees Fahrenheit) hardened the clay, melted the coating, and bubbled oxygen within the glaze, pushing iron ions to the surface. As the glaze cooled, molten iron flux flowed down the sides of the ceramics and crystallized into iron oxides imparting characteristic patterns. Based on coloration of oxides in the hare’s fur pattern, experts assumed it only contained the mineral hematite. The oil-spot pattern was thought to be made of the mineral magnetite. The new analysis, however, reveals hare’s fur patterns contain small quantities of epsilon-phase iron oxide mixed with hematite, while oil spot patterns boast large quantities of highly pure epsilon-phase iron oxide, a finding no one expected. The team used a variety of analysis techniques including optical microscopy, electron microscopy, Raman spectroscopy, and synchrotron x-ray techniques to assess the chemical composition and crystalline structures within the glaze. Epsilon-phase iron oxide was first identified in 1934, and only within the last ten years has it been fully characterized. Marked by extremely persistent magnetization, epsilon-phase iron oxide could hold the key to better, cheaper permanent magnets used in data-storage and other electronics. Moreover, the epsilon phase is non-toxic and highly resistant to corrosion. Unfortunately, modern synthesis techniques have only managed to grow tiny, crystals often contaminated with hematite. The oil spot pattern, with its pure epsilon phase of iron oxide, could hold the key to better synthesis techniques, says Dejoie.